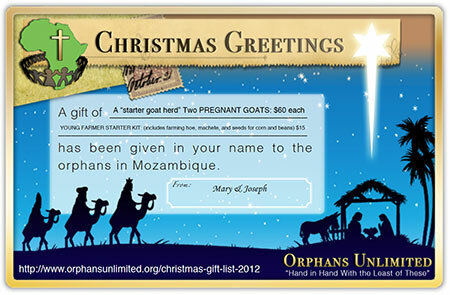 Below is our “ Christ­mas gift list” for our kids in Mozambique. Giv­ing a Christ­mas gift to a rel­a­tive or friend that ben­e­fits an orphan in Mozam­bique brings great joy to the child, and helps your fam­ily expe­ri­ence the true mean­ing of Christ­mas. Giv­ing a gift that brings life to another is what Jesus is all about. If you’d like to sur­prise a fam­ily mem­ber with a gift/s to the orphans in Mozam­bique, then send a card or small pack­age to them with a note inside telling your loved one that a gift of a “_________” has been given in their name to the orphans in Mozambique. Down­load the PDF of our 7x5 in. gift card. Use of Adobe Acro­bat is sug­gested. Fill in the form with your gift selec­tion. Even add your sig­na­ture to add your per­sonal touch. Print it or save it and send it. Below is our wish list with gifts of all sizes. Evan­ge­list Alberto Pes­sute trav­elled 4,500 miles (7500 km) as a cir­cuit rider teacher on his 50 cc motor­bike this year in order to teach 3 Bible Schools (100+ stu­dents) and start the 2 churches in Namuno county. He just called to ask for emer­gency help, as his motor bike “bit the dust” about 9 miles (15Km) out in the bush as he was com­ing back from teach­ing at one of our bush churches today. We knew the bike was near it’s limit, but had hopes that it would last through Decem­ber when the Bible School year was over and the 2 Namuno churches were able to be inde­pen­dent of his teachings. $750 is needed to pro­vide him with a new bike so Teacher Alberto can wrap up his teach­ing year. We have over 1,750+ orphans liv­ing with a grand­mother or aunt who lack the basics to live a healthy life. No mat­ter how small, each gift does make a dif­fer­ence. SPONSOR AN ORPHAN: (Pro­vides an orphan with food, cloth­ing, school mate­r­ial, school uni­form, and med­ical care in one of our Christ cen­tered fos­ter homes.) $30/month or one time gift of $360/yr. SCHOOL BACKPACK: (for the kid’s school sup­plies) $8 each. As our orphans grow up and leave our “nest”, they need a help­ing hand to get started. We have almost 100 kids need­ing Young Farmer Kits so they can start their own farms. Each of these kids is eli­gi­ble to enter into our 2013 Goat Rear­ing School, and receive a “starter goat herd” once they graduate. HYPO PACKETS: (For mal­nour­ished chil­dren; buys a baby a week’s worth of high pro­tein cereal) 50 cents or $100 buys 22 lbs. (10 kg) of Hypo and pro­vides 17 chil­dren with 4 months of high pro­tein food. ( Dixon, Zito, and many of our babies and mal­nour­ished tod­dlers were saved because of this high pro­tein instant cereal that must be bought in South Africa). We use about 200 lbs. ($900) (100kg) of it a year. Thank you for giv­ing to our chil­dren as we cel­e­brate Christ’s birth on earth. Bush Bunny Brenda and the staff of Orphans Unlim­ited, Inc.